So I am not the one who reads anything related to management or marketing or business. I run away from such books. 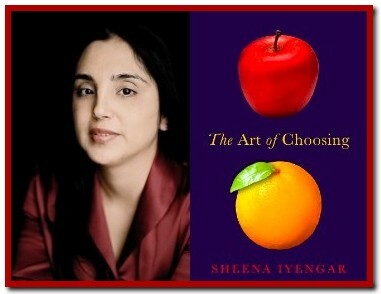 And then I chanced upon or rather “The Art of Choosing” by Sheena Iyengar was sent to me by the Hachette folks and I must say that I was in for a surprise. Malcolm Gladwell’s Tipping Point gave way to a plethora of psychological writing, rather psychological research that gave us an insight to ourselves and the way we behave and why we behave the way we behave, and in such a spate comes Sheena’s book that is absolutely realistic and is one of the best I have read in the genre. Yes you guessed it right! The book explodes about choices and how they affect us to how they do not. It looks at choices in cultures and how it varies – right from Japan, where people are more likely to be directed to where to work and what to wear to the US of A, where a five-year old is aware about the choices he/she can make. The eason I started with sub-cultural nuances and how they affect choice, is because it was my most favourite segment in the book. Simple and yet so relevant examples of choosing and how it is really an art proliferate through the entire book. From a simple instance of buying nail paint (unnecessary choice making situation) to buying a car or to a new gadget (brands more or less tend to produce the same gadgets with one or two added features), to her famous research on Jams in 1995. (You have to read the book to know about this one as I am not saying anything). What I personally found the most interesting was how we can categorize choices and we always do so without knowing it (sub-conscious choice-making process, may be. ). The idea really is that do we manage the alternatives in each category to begin with. And not to forget the part in the final chapter, when she discusses about choices being bad – especially when they are limited. How does one face or make them in that case? However, having said all of this, all I can say is that you must pick up the book and because it is not sermonizing, nor preachy or trying to make a point. It just shows us the mirror of who we are when it comes to making choices and do we need any gumption for it at all. Pick it up and be enlightened! P.S: I had the good fortune to interview Sheena over the phone. That will be coming soon. This entry was posted in Books, Review and tagged choices, consumerism, hachette, hachette book group, hachette india, sheena iyengar, the art of choosing on August 20, 2010 by thehungryreader.